Fiction: The Fourth Player by Marie Chow | LADY. The first time we played mahjong with I-Ling, her Taiwanese housekeeper served us sliced mangoes, prepared in the traditional island style, as a pre-game snack. The mangoes were sliced into thirds, and a crisscrossing grid was cut into each of the outer pieces; all we had to do was use our fingers to find and press the middle of the mango slice, against its hard skin, and – or so I-Ling claimed – like magic, little cubes of mango would pop up and out, ready to be eaten. “It’s amazing, the interesting customs, the little tricks these islanders have,” she said. Our original fourth, Mei-San, had recently moved from Kaohsiung to Taipei. She had suggested I-Ling as a replacement, and we had only reluctantly, grudgingly invited I-Ling, as none of us had been able to agree upon on our other nominees. Besides, we were all rather curious about her. Lee I-Ling was rumored to be one of the richest women in the city. While our husbands had fled the Communist “liberation” with clothes and a few trifles, hers had fled with gold, the only currency that meant anything. While our husbands had dreamt of returning to the mainland, insisting that Taipei was merely the temporary capital of China, hers had graduallyconverted gold into property, property back into money. We had wondered, at first only quietly, in the darkness of our own homes, where he had gotten the gold. We eventually decided it must have been corrupt money – bribery money, black market money. We reminded ourselves that during a war, no one profited from being honest, and that war-profiteering was the worst form of business. We assured ourselves that we were much happier with our own situations, not rich, but not poor either – for our consciences were clear. Nevertheless, her fortune, and the faint tinge of intrigue a rich husband brings, was enough. Rumors of her rather peculiar behavior had fueled both debate and outrage for years. People said she believed in, and made an open study of, Western religions: Christianity and other forms of spirituality. They said her parties were incense-heavy séances, where she relentlessly pressured her guests to convert, be baptized, or wash their foreheads in ash. Some said she lived like a hermit, while others claimed that her endless socializing had driven her husband away. They said she’d insisted on having her youngest child in the hospital – the only one in the city and newly expanded – when everyone knew that hospitals were for emergencies only. We’d shaken our heads over that particular story for weeks. Her eccentricities made her a semi-celebrity, and this had been the driving factor of our decision: to meet her, to see her firsthand, was an opportunity only Mei-San, who’d known her as a child, could arrange. I-Ling had accepted with alacrity, offering to host the first game in her house (mansion really, compared to our apartments). But seeing her now, in person, we found ourselves oddly disappointed. I-Ling’s shoulders were hunched, giving her the appearance of a much older woman despite the fact that her hair was barely tinged with gray and her skin was still mostly smooth and unwrinkled. After all the stories we’d heard about her, we’d expected someone unique, extravagant. Instead, I-Ling embodied the mundane and traditional. Her glasses hung from a coarse, braided rope around her neck, in stark contrast to the richness of her surroundings. Each time she leaned forward, the glasses brushed against the mango slices; each time she sipped her tea, her glasses clinked against her cup. And each time she moved, we noticed again the smallness of her feet – unnaturally, artificially small feet that we suspected from the beginning must once have been bound. We said nothing, holding our tongues out of politeness tinged with pity. “How ignorant she is!” we confided to one another as soon as she left the room. “How absurd!” We looked at each other, shaking our heads, wondering if we would have to find a new fourth. And of course, whispering, hissing in our effort to keep it quiet, “Did you see her feet?” We crinkled our eyes at each other, expressing both our sympathy and disapproval. But of course, we smiled kindly at I-Ling as soon as she came back. We held our tongues and instead pushed the sliced mangoes around and around the plates, eying each other covertly, trying not to giggle. We’d been so happy as our original four. We asked for towels to wipe our hands with, though our hands were fine – we had, after all, barely touched the mangoes. It was I-Ling’s sticky fingers we were worried about – our mahjong set wasn’t new, but it was nice, hand-carved with little ivory insets. Lee-Kung had smuggled it from the mainland almost seven years ago. Her husband had yelled at her, saying it was a silly, idiotic extravagance, heavy and awkward to carry as well as having no practical use, but Lee-Kung had persisted, toting the set in her personal bags as they had fled inland to escape the bombings of the Japanese, and then again later, when they had boarded ships to escape a lost civil war. That the set had survived, with only the eight of bamboo tile being slightly chipped at the corners and therefore readily identifiable during games, was remarkable. We had, all of us, grown attached to it. Besides, mahjong in Taiwan was still technically illegal (though of course, everyone looked the other way unless the people caught were public officials, government types and such who would’ve set a bad example and really oughtn’t to have been so idle) and we were quite possessive of our set, none of us wanting the trouble, the possibly criminal-type activities that might go along with procuring a new set. Going out and actually buying mahjong tiles would seem an illicit, willful disregard for the law -- but merely owning a set, and occasionally making use of it, didn’t seem terribly conspicuous or immoral. “I’m afraid I’m really not very good,” I-Ling confided just after the mangoes. We murmured sympathetically, withholding our judgment – skillful players often used modesty as a shield for their bragging. It wasn’t until we were all seated that she revealed she had never played before. Her parents had disapproved of mahjong, so she had never been taught. It wasn’t until last week, when Mei-San had told her we were looking for a fourth, that she had started learning the game. She’d taken lessons, she confided, from her housekeeper, who had only taught her the Taiwanese style, which involved sixteen tiles rather than thirteen. But she was a quick learner, she assured us, and would pick up quickly. We were disappointed at this news, but by then, it seemed too late to back out. Hadn’t we just eaten her mangoes and drunk her tea? Hadn’t we already sat down at her table – brand new, she told us, bought just for this occasion, a square table exactly suited for mahjong only -- and mixed the tiles? It would’ve seemed childish and rude to pack up and leave now. So we stayed, and by tacit agreement, began I-Ling’s mahjong education. I-Ling’s Taiwanese housekeeper walked in at that moment, and so we refrained from saying anything else about sixteen tiles, concentrating instead on showing I-Ling how thirteen was a much more sharply defined game – it was the traditional way, after all, and had been so for forever. We played the first full circle without money, just so I-Ling would have a chance to try things out. We waited patiently while I-Ling sucked on her teeth, making funny thwee thwee sounds while she decided which piece to throw. We looked around us, at the lush furnishings, the thick red cushions that covered our chairs, the various paintings – not just traditional Chinese water-style paintings, but also newer oil canvases from Europe or some other exotic locale. We looked at the poetry scrolls that decorated the walls, and silently decided that one round without money was enough – I-Ling could afford the losses. For her sake, we kept the conversation simple. We didn’t consider ourselves to be prying, merely curious, wanting to get to know our new fourth as quickly as possible. I-Ling took a long time considering our comments, lagging behind our conversation, sucking on her teeth, uncertain whether responding to the question or concentrating on the game was more important. I-Ling threw the tile one of us needed to win, and there was a pause in the conversation as we explained how to tally the winnings. While we mixed the tiles, we glanced sideways at each other; this only confirmed what Mei-San had already told us. We hoped that I-Ling would volunteer the information, but instead, we had to pry out each little bit. Her three elder sons had all been sent to America, for school – that was the initial reason -- and two had already graduated and decided to stay. The opportunities were better there. And also, I-Ling admitted reluctantly, they had girlfriends there. Chinese girlfriends, she assured us quickly, from similar situations and backgrounds – appropriate girlfriends -- but apparently, no more eager to return home than her sons had been. We nodded to one another, torn between envy that they were rich enough to send their sons to America and pity that their children would choose to stay away, choose to abandon their parents. We looked pointedly at the jade bracelets on her arms, the gold around her neck, the paintings and scrolls along the walls. “I miss them of course,” she paused and reached for her glasses, putting them on for the first time, and, squinting at her pieces above her glass before throwing the piece that one of us needed to win. We would have continued prying if her young son, a little boy of about three or four, hadn’t come running into the room. We laughed weakly, more surprised by his appearance than his announcement. For a three- or four-year-old to be finishing his potty-training might be a little slow, but not completely unusual. What was much more interesting, and infinitely more scandalous, was the fact that I-Ling’s little boy was wearing a bright red dress – not a traditional smock that might be unisex, but a very fashionable, frilly, red dress, with a lace petticoat peeking out from underneath its hem. We each leaned forward a little, shocked and confused, wondering if we had misinterpreted – reflecting back on what I-Ling had told us, wondering if she had in fact revealed her child’s gender, or if we had merely assumed that all her children were male. “Aren’t you proud?” the child asked; the voice was too high-pitched to reveal gender yet; the haircut was masculine. The child pouted, eyes narrowing, studying us for the first time, before whispering something in I-Ling’s ear. She shook her head at him, smiling faintly, and he slid off her lap, skipping and running out of the room, the red frills at the hem of his dress flapping wildly. None of us wanted to be the first to speak or question. I-Ling looked at the winning hand and asked how much she owed. We interrupted each other ruthlessly, but I-Ling merely put her glasses on again, squinting and counting her money meticulously before looking up and replying. Again, the artificial nonchalance. “He’s never home. He can’t object to what he doesn’t see – and he doesn’t pay attention to what he does.” She paused now, removing her glasses and leaning forward to mix the tiles. For the first time that afternoon, we followed her lead. She paused and organized her tiles while we absently shuffled ours. We weren’t paying attention to the tiles we were throwing. Had I-Ling been a more cunning or skillful player, she might have secured her first winning hand. Instead, the round came to an end with a draw; none of us had been paying enough attention to assemble a winning hand. “What about them? Didn’t they have anything to say about the pictures?” Our words seemed to trip over each other, our minds stumbling over a myriad of possibilities and explanations, none of them fully articulated. We mixed the tiles with more force than necessary, trying to drown out our thoughts as well as silence any more inappropriate remarks we wanted to make. I-Ling smiled faintly, “When he begins his schooling next year, he’ll have a uniform to wear – for now, I let him decide. He’s just a child. What difference does it make?” She spread her hands in supplication and we could not immediately answer. We felt the difference, a significant one, but none of us could think of any reasonable objection that wouldn’t sound silly, even more preposterous than the situation already was. “Besides, I’ve always wanted a daughter – and it’s nice, to make-believe once in a while. What’s the harm of a little make-believe?” She threw the four of bamboo, and as the hands had just been dealt, we absently reminded her that it was better to throw away the end pieces, as the middle ones were more likely to be useful later on. Again, we had no reply. Most of our parents had also stayed in the mainland, choosing life and death in their homeland rather than chance and opportunity on an island – many of us now joked about being orphans, but what use was there in dwelling on things we couldn’t change? Had we known I-Ling better, we might have voiced our opinions more fervently and tried to reason with her. As it was, we remained mute, and played badly. Later, we discussed the possibility of getting a new fourth. We decided that I-Ling wasn’t a bad person, just misguided -- sick was the word we sought and found – and we agreed that we should be the ones to cure her. We convinced ourselves that I-Ling needed guidance, friendship, wisdom. We were determined to provide her with all of the above. Besides, we felt sorry for I-Ling, and perhaps a bit perplexed. We didn’t understand how someone with so many riches, so much position, could still be so unhappy –and more than that, we didn’t understand how she could be so deluded, not even having the most basic understanding that certain things simply can’t, and, more importantly, shouldn’t be changed. We’d told only our closest friends about both the afternoon’s events and our decision. They’d all leaned in eagerly and nodded sagely – they’d agreed that our influence on I-Ling could only be positive. We spent several months carefully solidifying I-Ling’s mahjong education. She was an absent-minded player, and often, her mistakes lined our pockets, but she never complained, never begrudged us our winnings; in time, the rumors died down and we relaxed. We’d seen Shi-Fu again, for he frequently popped in during our games, but never again in a dress – though whether this was because he no longer wore them, or if I-Ling had merely advised him that, like his father, we also disapproved, we never knew. I-Ling rarely reprimanded him – both mother and son ignored our more obvious displays of disapproval over their outward displays of affection. As the years passed, we simply learned to forget. We bought houses and apartments; we bore children. We buried our parents, and any other relatives who had stayed, from across an ocean of grieving, and we pretended it was bearable. We forgot we were ever worried about how I-Ling was raising her children. We had our own children to raise and worry about, and politics – mostly the American – claimed what little spare time we had. We gnashed and ranted over Nixon and Kissinger, over the seat in the U.N. and other more worldly matters; in comparison, I-Ling’s trivial little eccentricities were so familiar and routine we could hardly remember them ever being remarkable. Yet her wealth remained a barrier between us. While the three of us remained close friends, I-Ling was always merely the fourth player at our table. Her wealth made her too idle, and she was constantly trying to fill her spare time with a variety of hobbies we had no interest in. For a few years, she took lessons – private lessons where respected tutors would come to her house especially to tutor her – in French, English, Spanish, and briefly, Russian. When we asked her why she bothered, she merely smiled, saying one never knew when such skills might come in handy. She said that her husband traveled a great deal, and perhaps, when Shi-Fu was older, she would vacation with him, and let the world be his university -- and at such a time, the languages would be necessary. “Ahead of your time, like your husband,” we would say, reminding ourselves that her rich husband was always away, while ours stayed close to home. She’d given up on her American sons by then, and often declared that Shi-Fu was her true child, her only child. She shared each of his accomplishments with us, as if they were her own, and often, even when he was older and was no longer interested in our mahjong games enough to bother us, she would call him into the room, and brag about him while he twisted and turned with modesty and pride. After her language lessons came music. She had a piano imported from England. She said it had all been her husband’s idea, and while her husband had been away, for three months one year, doing business in America, she had practiced ceaselessly, hoping to surprise him when he returned. The first time she played for him, he had fallen asleep, and thereafter, had declared that her playing was the best sleeping aid he could ever hope for. He had always had trouble falling asleep, and the piano music soothed and comforted him as nothing else ever had. From that day on, I-Ling played piano nightly for her husband, half an hour before her own bedtime, so that he could fall asleep more easily. She didn’t mind, she confided – she was glad that he appreciated her music, and, more than that, that she could perform some service for him. We never asked her to play for us. We meant to, and talked about it often, on shopping trips we’d forgotten to invite her to, and lunches we had without her, but we just never got around to it. 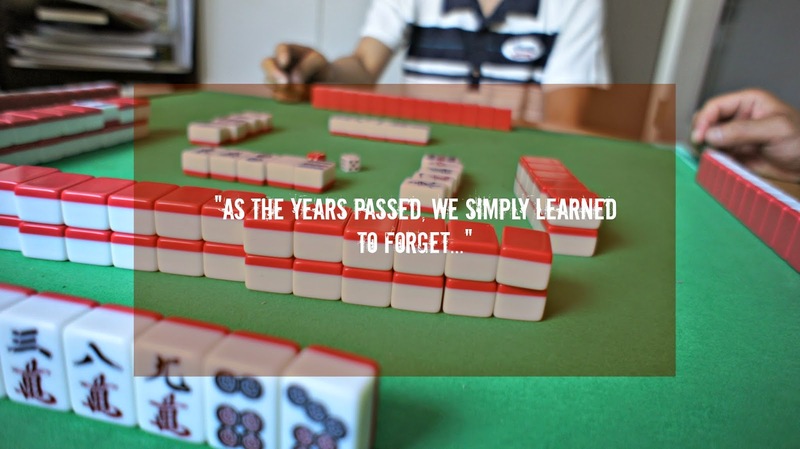 The last time we played mahjong with I-Ling, her maid served us freshly peeled lychees in a homemade syrup. Serving us fruit, usually runny, sticky fruit, was a bad habit she never grew out of. Afterwards, we had played for two full circles, with no one being a particularly big winner or loser. We heard Shi-Fu come in that night, heard him slam into his house and berate the housekeeper – a new one by now, but still Taiwanese. He was screaming, asking whether or not she had known about this, whether his mother was insane, whether she was trying to make him a joke, a gay, a mutant. I-Ling’s hand shook as she pushed herself from the table, not speaking to us, not even nodding as she left the room. We sat, not knowing whether or not to excuse ourselves, when the shouting became loud enough for us to hear. I-Ling made a reply, but not loudly enough for us to hear. There was a muffled sound and the crash of piano keys, and then the front door slammed again. We looked at one another, remembering our own role in spreading the rumor all those years ago; we squirmed in our seats and mixed the mahjong tiles again and again. Several minutes later, I-Ling came back into the room, her glasses hung crookedly around her neck, her face looked bleached, half toned, her skin stretched tightly across her features. To console or comfort would have seemed hypocritical – hadn’t we warned her that it was unnatural? Instead, we played silently, finishing the last circle before making our various excuses. Next week, I-Ling’s housekeeper greeted us. I-Ling was too sick to play -- she’d meant to call but simply hadn’t felt well enough. When the housekeeper returned, we made our excuses hastily and haughtily – we were careful not to let her see how insulted we felt. The next day, I-Ling sent each of us a brief note, succinctly explaining that she wouldn’t be available to play mahjong any more. She explained that Shi-Fu had gotten accepted to an American university, a very good one, and that she was going to be much too busy helping him prepare during the coming weeks. She said she’d try to get in contact with us afterwards, and hoped that we’d take care in the meanwhile. We threw the letters away and for a few days, said nothing, not even to each other. Then we started telling our other friends the news – not the version we’d heard and guessed during our times there, but I-Ling’s version, from the letters. We said I-Ling was bubbling over with pride about Shi-Fu’s acceptance. We explained that we would, of course, miss I-Ling and our weekly games, but we assured everyone it was only temporary break. We talked about visiting her. Often in the weeks that followed, the three of us would meet for a late lunch on the Fridays we used to reserve for mahjong. We discussed calling ahead and bringing fruit – sliced mangoes, we’d joke with each other – or just showing up on the doorstep one day, perhaps we’d have more luck the second time around. We argued about whether we should go individually or as a group – we thought it’d be easier for her if we went separately, but then couldn’t decide which one of us was closest to her. We started questioning what we really knew about her – after all, once a week over mahjong was hardly a way to make a lifelong friendship. We thought about going together, maybe bringing the mahjong set to show her that we still wanted to play, but that seemed somehow too pushy, too forward. She’d never been a terribly skillful player we reminded ourselves. Perhaps she was happier without the disruption. We talked about calling, but somehow, never got around to that either. After the first few months, we rarely mentioned I-Ling, and we heard almost nothing about her. She was still one of the richer ladies in town, but even Kaohsiung was booming with industry now, and newer, richer, younger businessmen and their wives were gradually taking over the social scene. I-Ling became just an archived story. Very few people even remembered ever speculating about her strange ways, except to say that they thought they were pretty sure that she’d gone off to America one year, or was it China? No one seemed to know for sure, and no one found out. We tried, for a little while, to find a new fourth player. But by then, most of our peers already had their regulars, and were unwilling to break up their tables to complete ours. Most of the younger generation only played the sixteen tiles style, and besides, they weren’t interested in playing with a chipped set, where you could always tell where one of the eight of bamboo tiles was located. We eventually broke up and drifted off, only gathering now and again, when there were enough people interested, to play the thirteen tiles style and talk about how things had been, before.